Blackberry Bramblings: Weekend Watercolor Workshop set for April 12 at Inn in Camden Maine. Weekend Watercolor Workshop set for April 12 at Inn in Camden Maine. Award winning Maine artist and gallery owner Marsha Donahue has created a new artist experience! A weekend long immersion in art...in a relaxed setting at the Inns at Blackberry Common. Donahue is the owner of North Light Gallery and has taught both privately and at the Maine College of Art for over 16 years. But this workshop she calls "Getting Cozy with Watercolor" is something new and exciting! 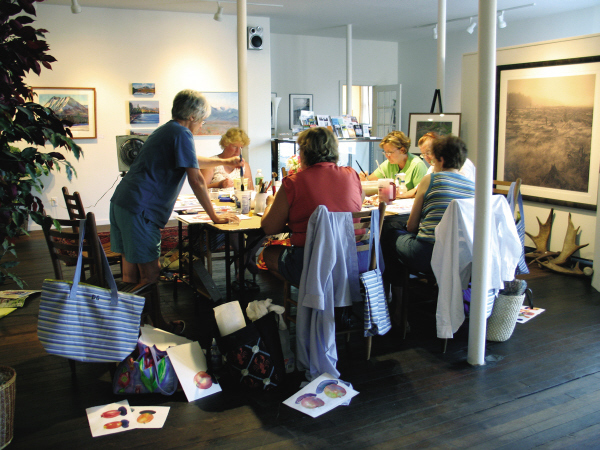 The two day workshop is designed for both the novice and the experienced painter. And since the setting is Camden Maine the inspiration of nature and the sea may play a key role in the classes! Plus it will be a unique experience for attending artists to share not only their workshop time, but also enjoy getting to know each other on a more relaxed level. The event begins with a wine reception on Friday night. Artists will all be staying at the inn and will enjoy fireplaced guestrooms, gourmet breakfasts and a themed dinner on Saturday evening. The sessions will take place all day Saturday and end on Sunday afternoon. Having the Inn filled with artists will be fun for other guests too! Perhaps there will be a budding new artist who will find their muse! There are still rooms available, but only a few spots remain for the workshop series. Total cost for the weekend event is just $385, plus tax. For more information about Marsha Donahue visit North Light Gallery .